Category: The Eighties! They’re Back! 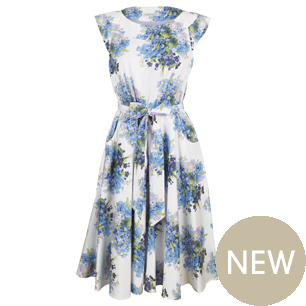 I didn't realize Laura Ashley still made dresses (I was still thinking of them as your go-to for floral tissue-box covers) but hey, here's one, and it's lovely. Big pockets! Cap sleeves! Blue flowers! I didn't check if they ship to the US, and it's on the expensive side in pounds anyway (I always want to write "pounds sterling" — I'm sure there's a difference, but I've never been enlightened as to what that difference is). Someone very nice sent me this link. I can't find the email now. Take credit in the comments, please! Don't look around, computer lady. I'm talking to you. (Oh wow, this is just like TRON!) Don't have that "oh hell no," I mean "oh heck no," look on your face, 'cause you know me. That's right. You would have TOTALLY, like TO THE MAX, made me when you were in junior high school, but your sewing skills just weren't up to it. You were, like, too lame. You didn't think you'd be able to pull off all these buttons and flounces, so you just didn't try. Bet you're sorry now, huh? There could be tons of pictures of you wearing this dress, only in toothpaste green! That would be *awesome*! Also, I'm pretty sure you also had one of these lace hair excrescences! Aren't they, just, too cool? Add an armful of rubber bracelets and we can hit the dance, no problem.